For over 50 years now, the extraction of crude oil and natural gas from Nigeria's Niger Delta has meant wealth for a privileged few but has exacted heavy costs on residents and the environment. Nigeria is the world's 8th largest producer of crude oil, yet remains one of its poorest nations -- an estimated 70 percent of its 150 million residents live below the poverty line. The environment is paying a steep price as well. 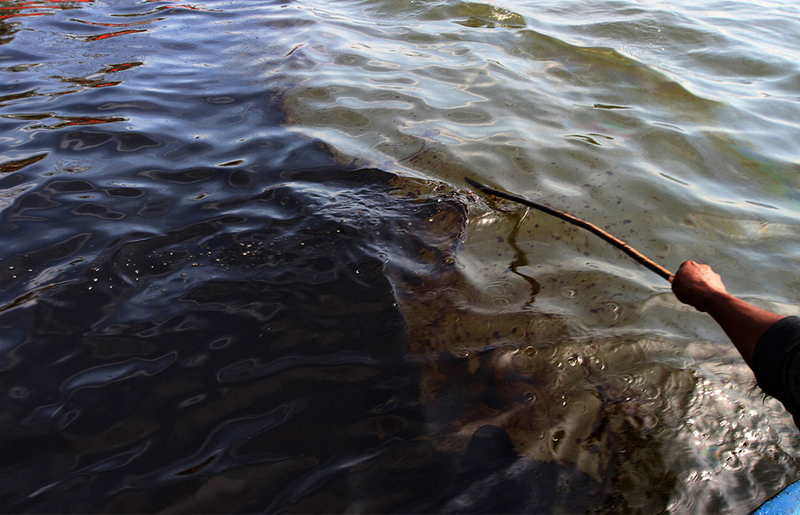 An estimated 500 million gallons of oil have spilled into the delta -- the equivalent of roughly one Exxon Valdez disaster per year. A number of factors have contributed to these disasters: poor construction and maintenance, lax regulation, militant attacks, and petroleum thieves, not to mention government instability and abuse of power. According to cables released by WikiLeaks, Shell Oil claimed to have planted staff in all of Nigeria's main ministries, gaining access to key government decisions. Gathered here are some scenes from Nigeria's long, disastrous relationship with the crude oil industry. 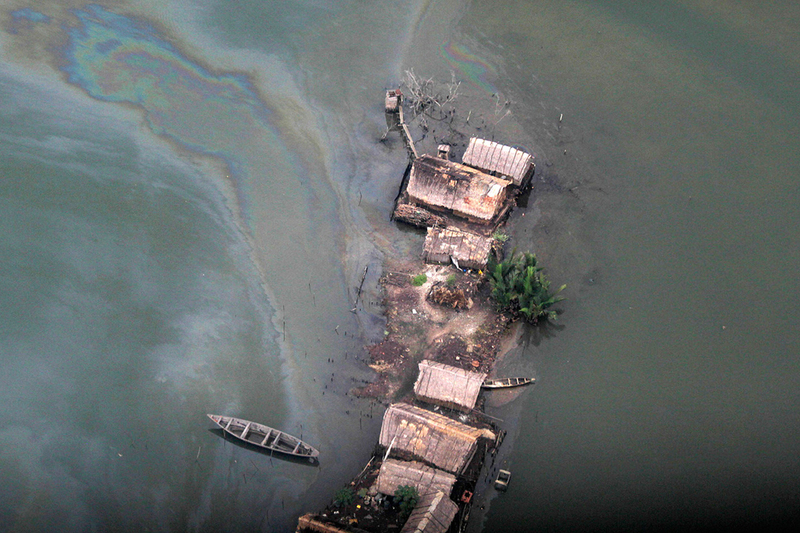 Oil flows past a sunken boat in a creek near an illegal oil refinery in Ogoniland, outside Port Harcourt, in Nigeria's Delta region, on March 24, 2011. A woman carries tapioca seeds, earlier set out to dry near a gas flare fire, on April 20, 2007, near Warri, Nigeria. 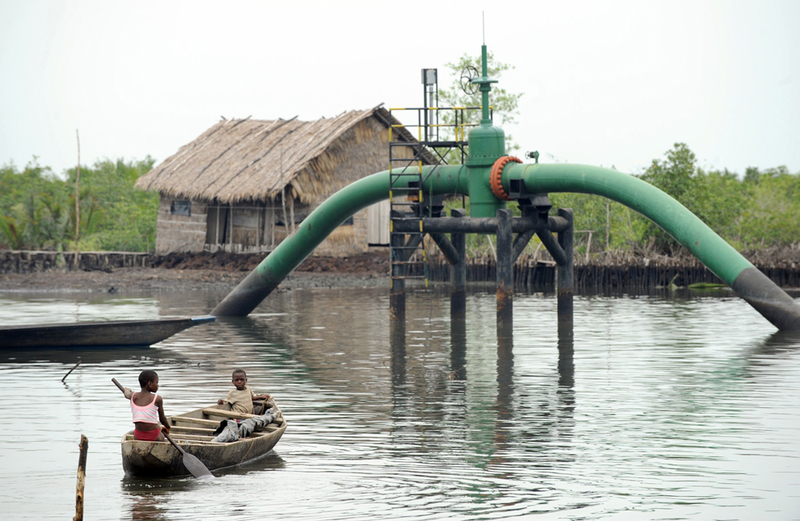 Children sail past an oil pipeline near their home at Andoni settlement, Bonny waterways in Rivers State, Nigeria, on April 12, 2011. 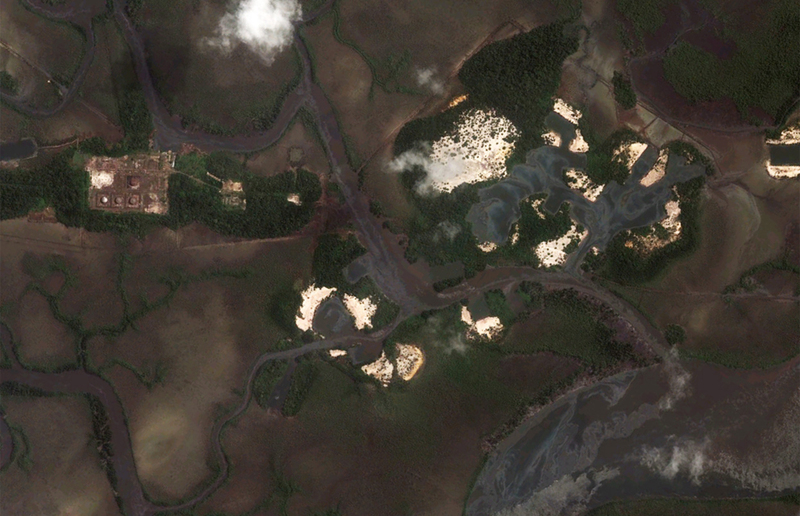 An aerial view of an aging petroleum facility and crude oil spillage in a mangrove swamp near Warri, Nigeria. 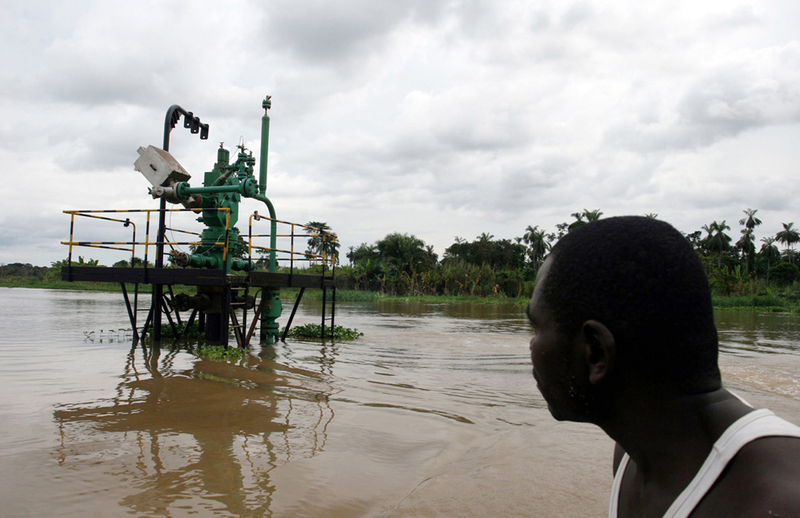 A man looks at an oil well on the river Nun in Nigeria's Delta region, on October 26, 2006. A woman lays clothes out to dry on oil pipelines running through the Okrika neighborhood of Port Harcourt in Nigeria's oil-rich delta region, in this Oct. 7 2006 photo. 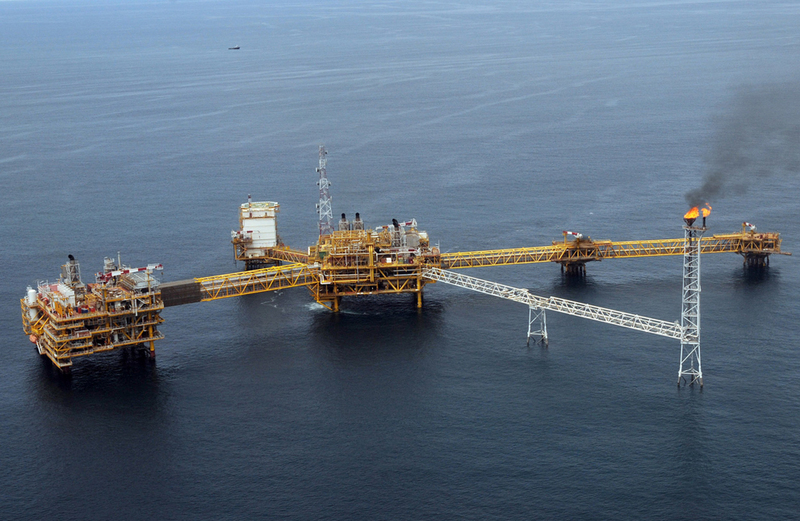 An aerial view of Total oil platform at Amenem, 35 kilometers away from Port Harcourt in the Niger Delta, seen on April 14, 2009. Gas flaring at the Total oil platform at Amenem, offshore from Nigeria, on April 14, 2009. Flaring is a common practice in the petroleum industry, where it is used to eliminate waste gas which cannot be easily used or transported. 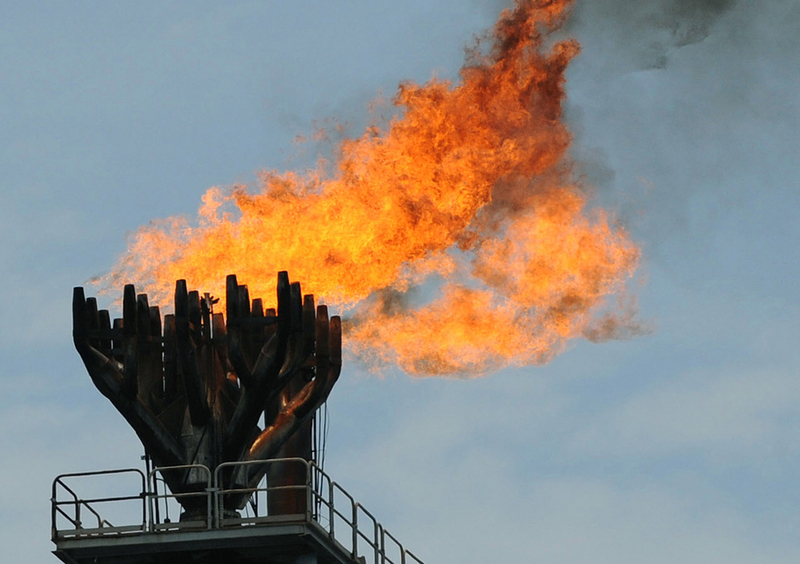 Excessive flaring is generally considered to be wasteful and harmful to the environment, releasing massive amounts of toxic and greenhouse gases contributing to health concerns and climate change. 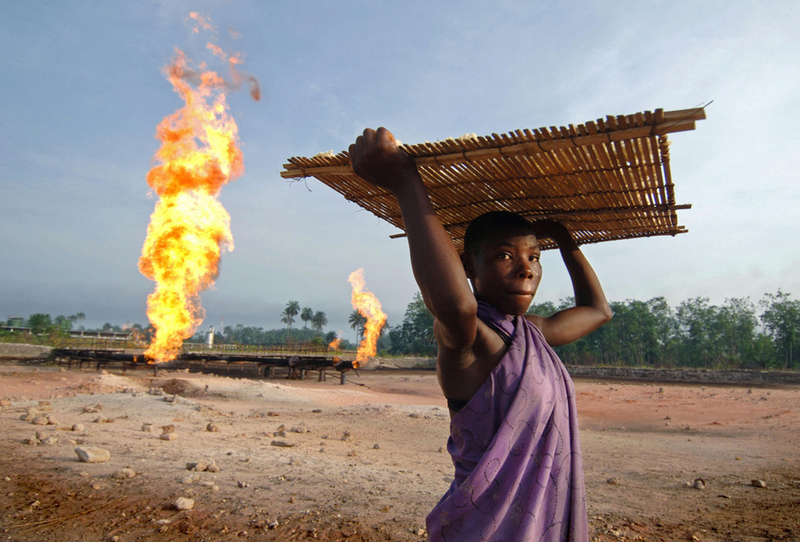 Nigerian oil companies burn off the second largest volume of natural gases in the world, with the practice of gas flaring. 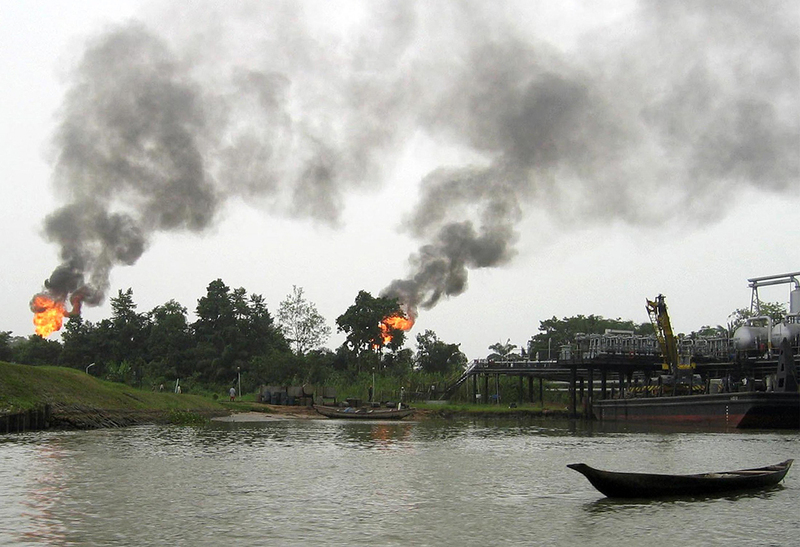 In 2008, Nigerian flares burned off an estimated 15.1 billion cubic meters of natural gases, or roughly 70% of the overall gas recovered that year. 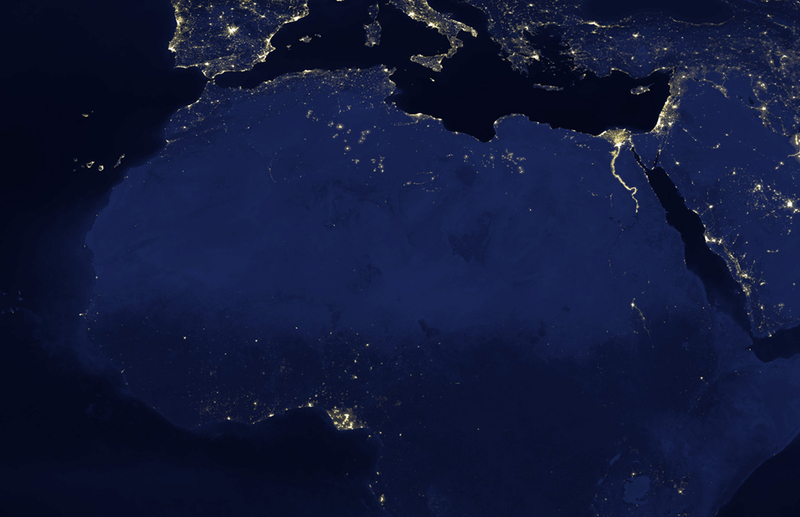 The flares are so prevalent, the Niger Delta appears brightly lit (lower left) in this detail from a NASA image of the Earth at night. Flare activity at night from 1994 through 2007 is also visible as a movie compiled by NOAA. 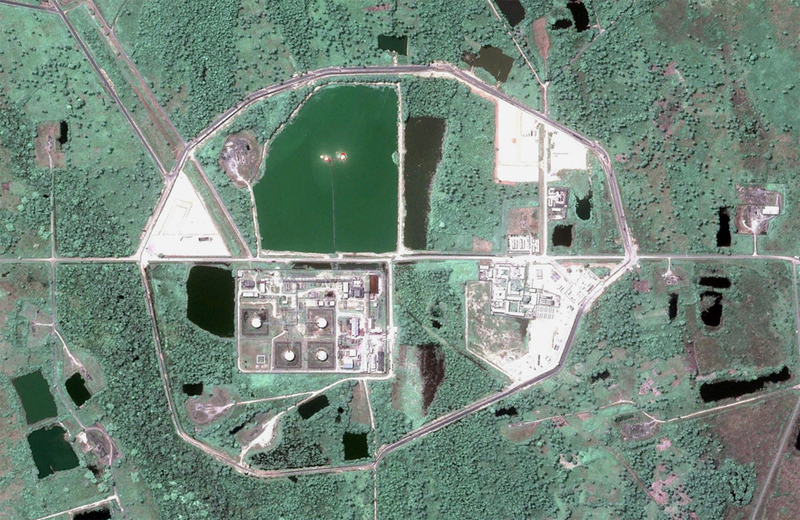 A petroleum facility with two natural gas flares (upper left) visible with Google Earth, near Ogbogwu, Nigeria. Natural gas flares burn at an Italian-operated oil facility at Abama, Bayelsa state, in Nigeria's southern delta, on March 12, 2004. 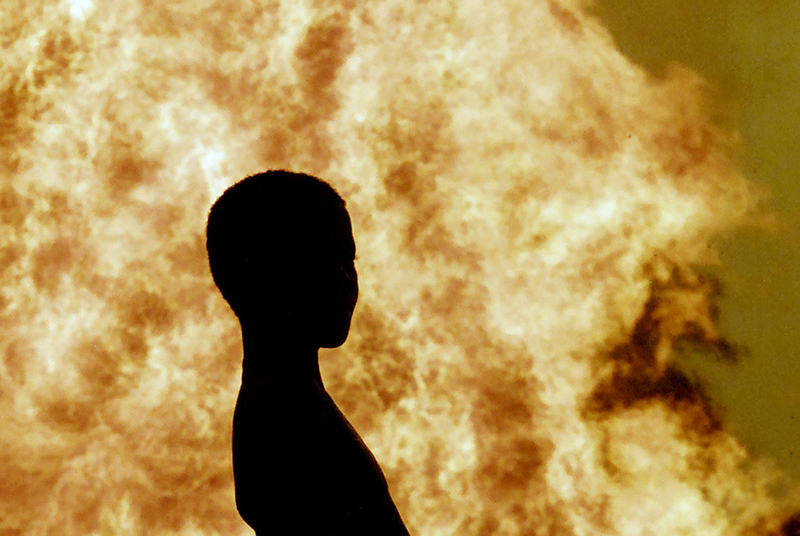 A Nigerian child is silhouetted against a gas flare at Utorogu facility of Royal Dutch Shell in the Nigeria's southwest delta, on April 16, 2004. 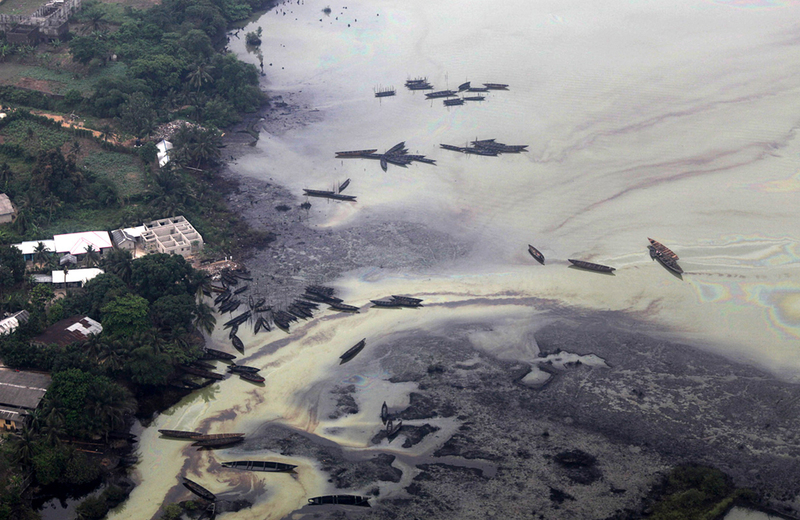 A view of an illegal oil refinery is seen in Ogoniland outside Port Harcourt in Nigeria's Delta region March 24, 2011. 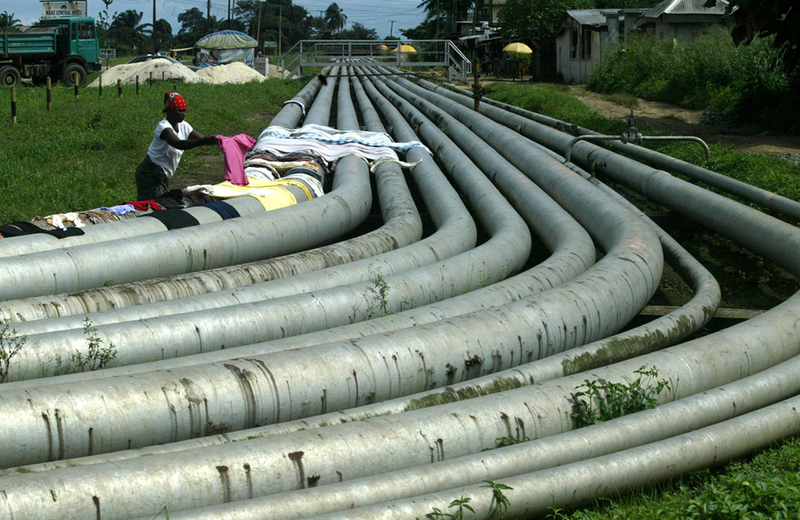 Crude oil thieves -- known locally as "bunkerers" -- have been a fact of life for years in Africa's biggest oil and gas industry, puncturing pipelines and costing Nigeria and foreign oil firms millions of dollars in lost revenues each year. 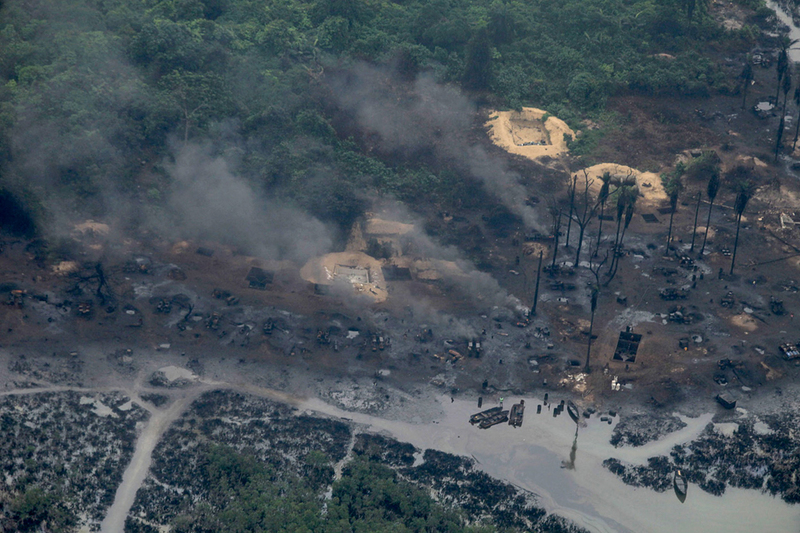 A view of an illegal crude oil refinery site in the creeks of an Ogoni community in Nigeria's Niger Delta, on July 7, 2010. 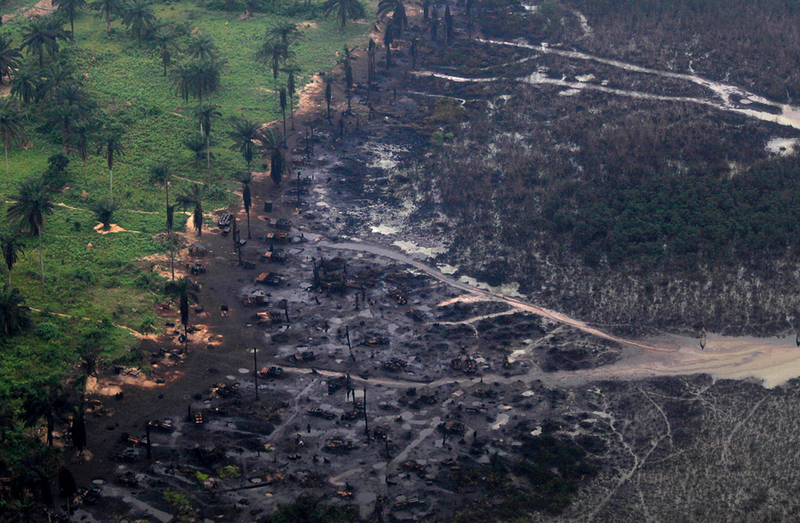 A view of an illegal oil refinery, cut away oil barrels and oil-stained ground, is seen in Ogoniland outside Port Harcourt, Nigeria, on March 24, 2011. 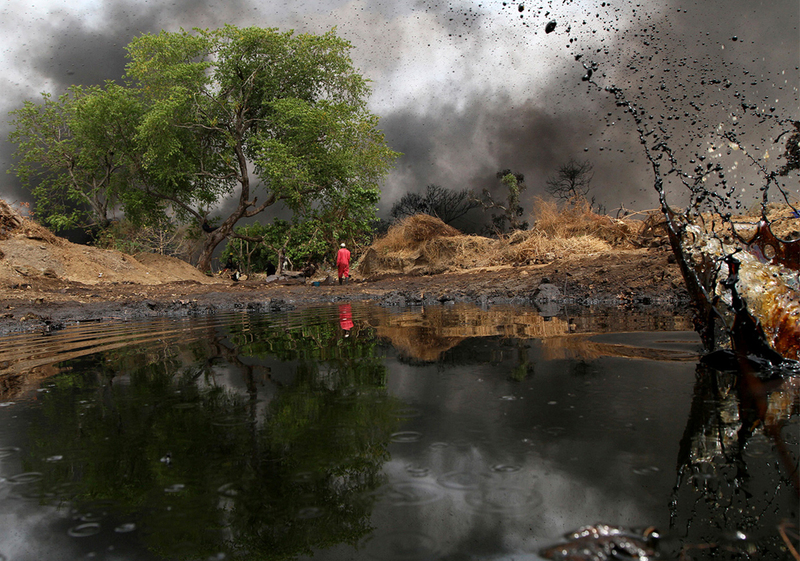 Smoke rises from an illegal oil refinery in Ogoniland outside Port Harcourt, Nigeria, on March 24, 2011. 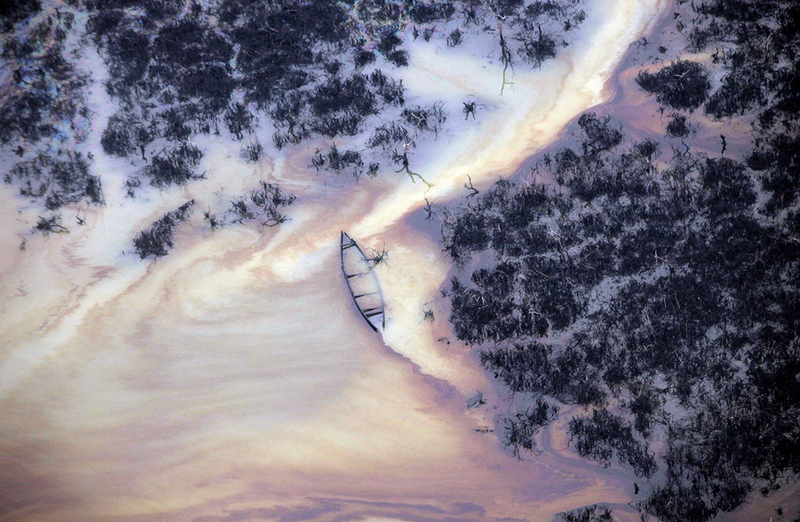 Canoes used for siphoning crude oil to illegal oil refinery are scattered on a creek in Ogoniland outside Port Harcourt in Nigeria's Delta region, on March 24, 2011. 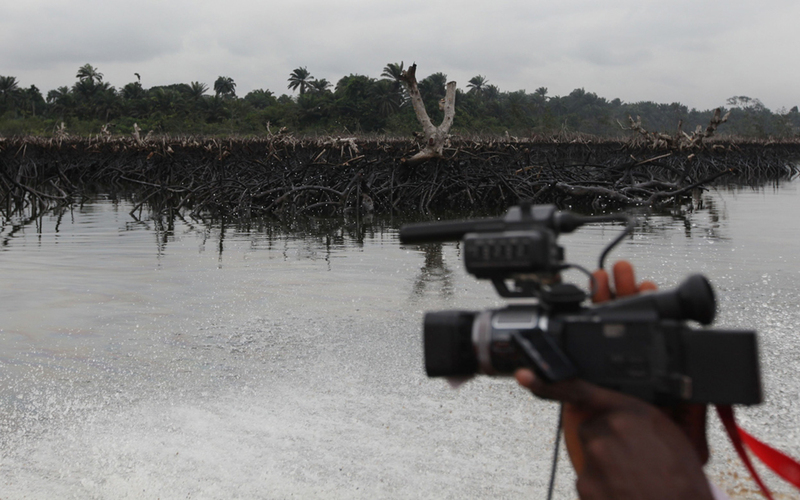 A cameraman films mangroves destroyed by an oil spill in creeks near Bodo City, in Nigeria's oil-rich Niger Delta, on June 20, 2010. 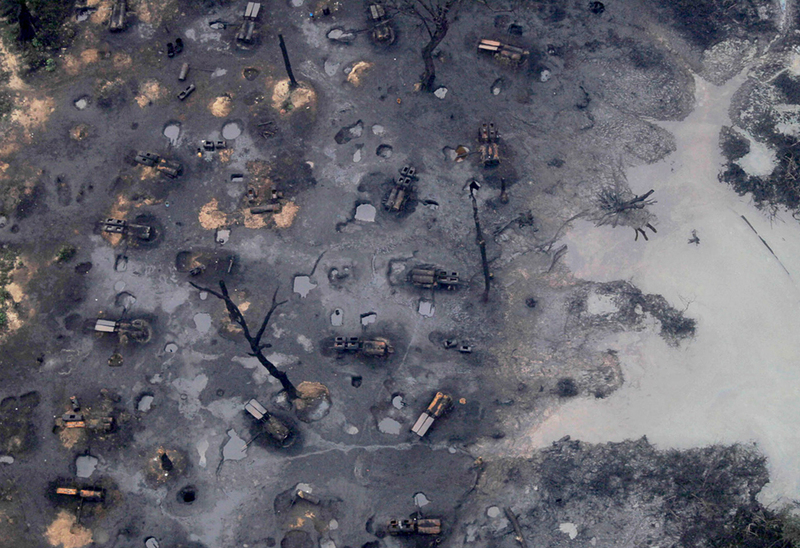 An aerial view of an oil spill site in the creeks of an Ogoni community in Nigeria's Niger Delta, on July 7, 2010. 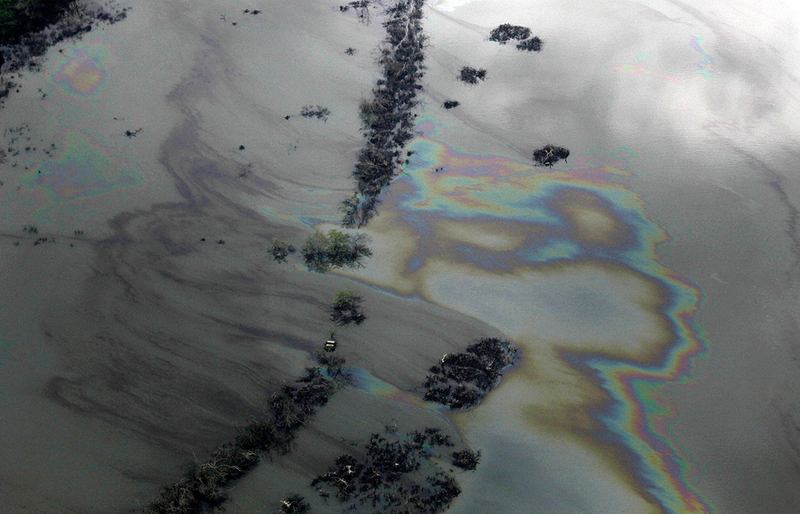 A man stirs the water to show the oil spill in the river in Ogoni region of the Niger Delta, on June 10, 2010. 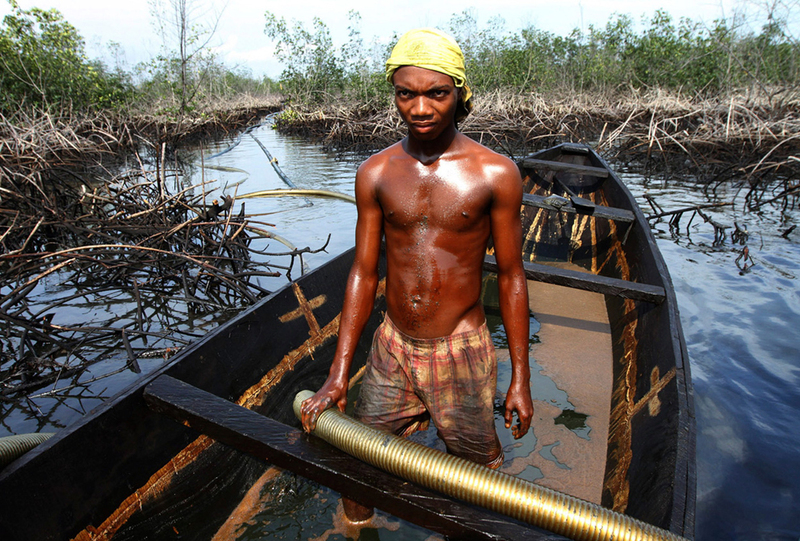 A boy standing in a canoe holds a hose to siphon oil from a spillage site on a river in Bodo community in Ogoni region of the Niger Delta, on June 10, 2010. 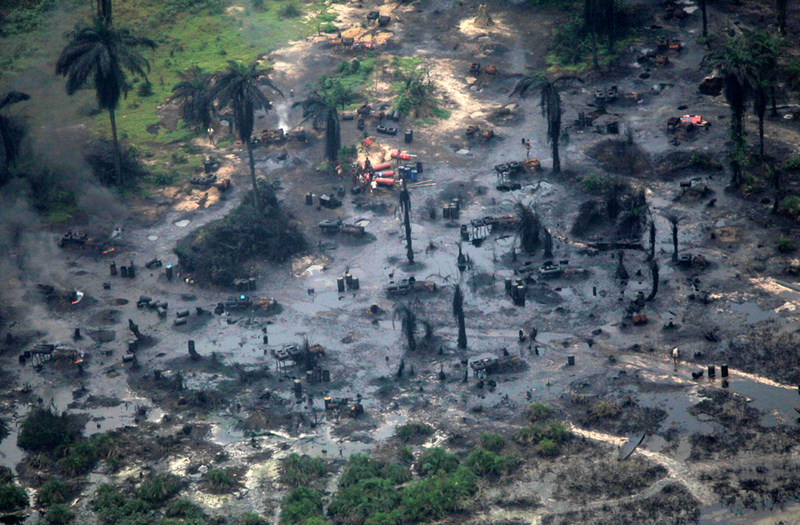 An aerial view of a village on an island near an oil spill site in a creek in the Ogoni region of the Niger Delta, on July 7, 2010. 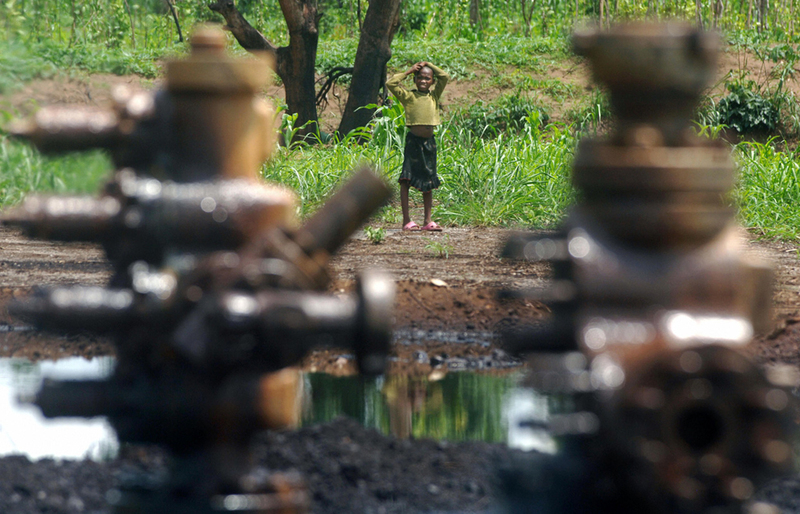 A child looks towards an abandoned oil well head leaking crude oil, on April 11, 2007, in Kegbara Dere, Ogoni Territory. 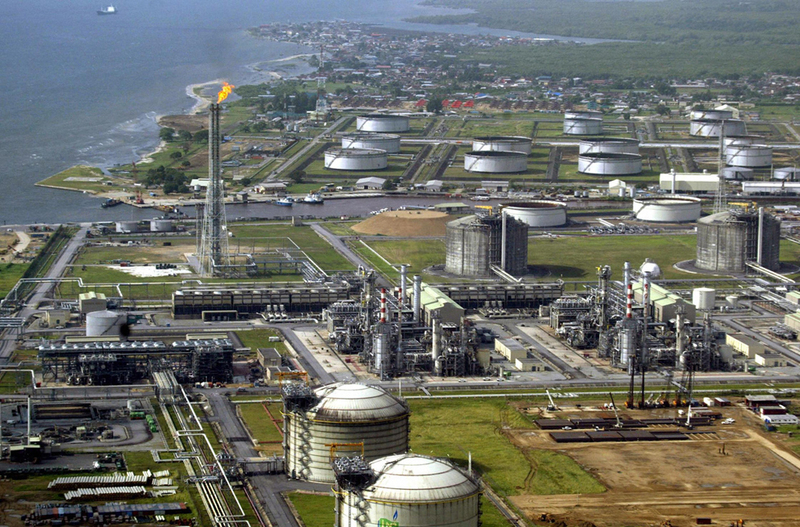 Part of the oil port facility at Bonny, Nigeria, the main shipping point for the crude oil flowing out of the Niger Delta region. 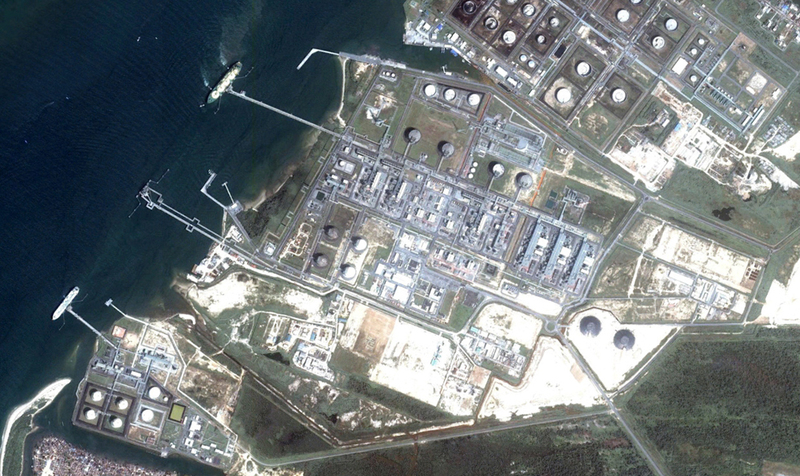 Royal Dutch Shell's oil and gas terminal on Bonny Island in southern Nigeria's Niger Delta, seen on May 18, 2005. 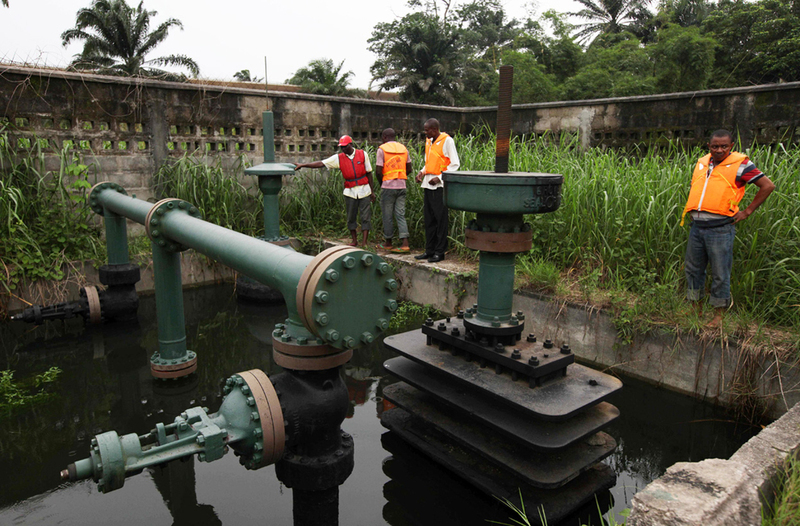 Local residents stand around a manifold for Royal Dutch Shell's Nigerian subsidiary, in Bodo City, in the oil-rich Niger Delta region of Nigeria, on June 20, 2010. 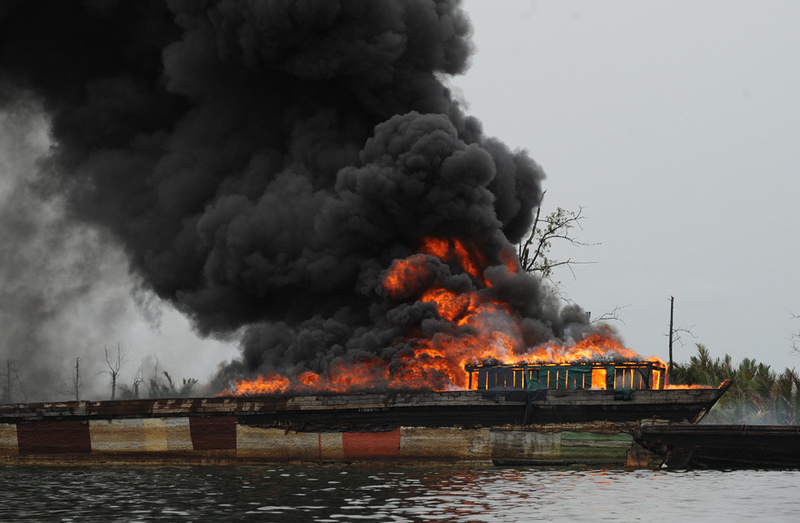 Fire rages on two wooden boats with crude oil seized by the military from oil thieves in the Andoni area of Rivers State, Nigeria, on April 12, 2011. A Joint Task Force, comprised different arms of the military, seized a barge with large quantity of crude oil and burned seized wooden boats used by thieves to siphon crude oil from pipelines. Spilled crude oil floats on the waters around the Niger Delta swamps of Bodo, a village in Ogoniland, which hosts the Shell Petroleum Development Company (SPDC) in Nigeria's Rivers State, on June 24, 2010. 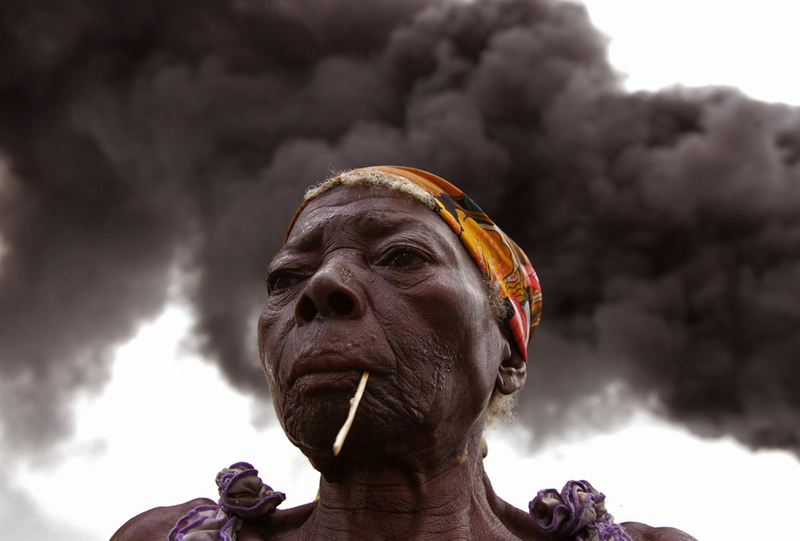 Smoke is seen behind a woman, after an oil pipe line started burning two weeks ago, close to the town of Kegbara Dere which is situated around 55 km (34 mi) from Port Harcourt, Nigeria, in this April 19, 2007 photo. 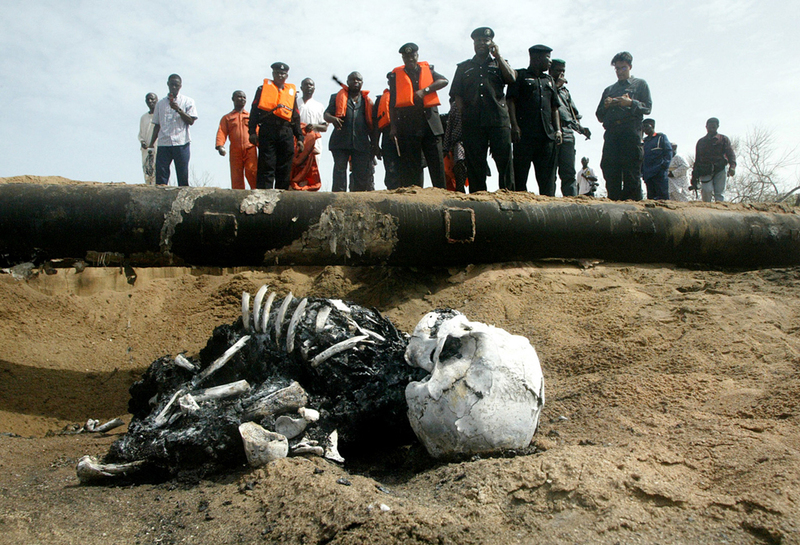 Police and officials stand above a skeletal burned corpse lying on the ground next to a gas pipeline that exploded at the waterside village of Ilado, about 45 km east of Lagos, Abuja, Nigeria, on Friday, May 12, 2006. Gas gushing from the ruptured pipeline exploded Friday as villagers scavenged for the free fuel, setting off an inferno that killed up to 200 people and left charred bodies scattered around the site. 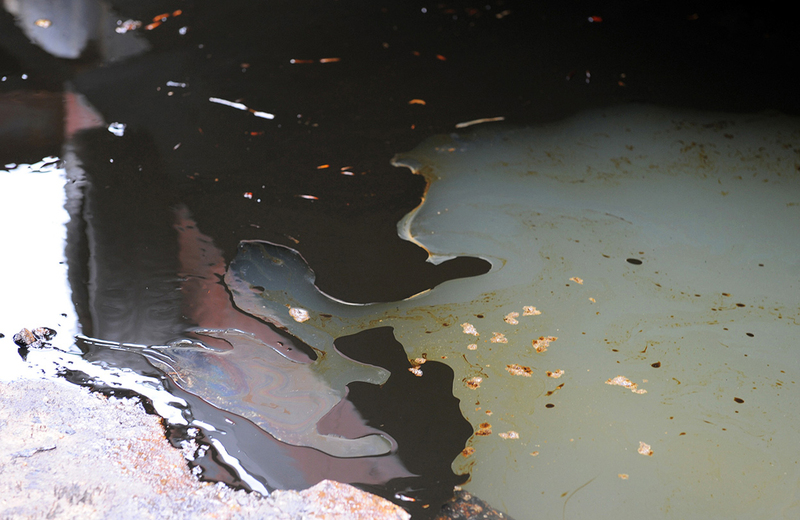 Crude oil spills from a pipeline in Dadabili, Niger state, on April 2, 2011. 2 responses to "Nigeria: The Cost of Oil"